4 "WAKE UP DEMOCRATS! Take Back the Country"
13 DC Protest Against "The Surge"
26 "Where Do We Go From Here?" Medea Benjamin is married to Kevin Danaher. Medea Benjamin is the founding director of Global Exchange, helped to bring together the coalition United for Peace and Justice and co-founded CODEPINK, a women initiated grassroots movement working to end the war in Iraq, stop new wars, and redirect resources into life-affirming activities. She is the co-editor (with Jodie Evans) of Stop the Next War Now. In 2005, she was one of 1000 women from around the world nominated collectively for the Nobel Peace Prize. Her work for peace and human rights has taken her to many parts of the world, including China, Afghanistan and Iraq. In 2000, she was the Green Party USA candidate for United States Senate from California. In 1992 Medea Benjamin Global Exchange, San Francisco, endorsed the Committees of Correspondence national conference Conference on Perspectives for Democracy and Socialism in the 90s held at Berkeley California July 17-19. “The Battle After Seattle: Globalization and Its Discontents” featured Medea Benjamin co-founder and executive director of Global Exchange, David Abdulah, education director of the Oilfield Workers Trade Union of Trinidad and Tobago, Hector Figueroa of the SEIU, and Mark Seddon from the executive committee of the Labour Party in Britain. Benjamin spoke of channeling grass roots movements for global justice into battles that are directed at local institutions and are winnable, such as the anti-sweatshop campaigns being waged at universities across the country, and the pressure campaign against Starbucks to promote less exploitative trading agreements. John Nichols, Gus Newport, Medea Benjamin, Mildred Williamson The protection of the right to vote, ballot access, electoral campaigns that are independent of corporations and major political parties. Speaking out for labor against the war: Brenda Stokely, president of AFSCME 1707 and Local 215 as well as a co-convener of New York City Labor Against the War; Fred Mason, president of statewide Maryland and D.C. AFL-CIO; Michael Letwin from U.S. Labor Against War and Dr. Nadia Marsh from Doctors and Nurses Against the War. ANSWER speakers included Youth and Student Coordinator Peta Lindsay, Elias Rashmawi from the Free Palestine Alliance. Jennifer Wager from IFCO/Pastors for Peace, Mara Verheyden-Hilliard from PCJ and Larry Holmes and Brian Becker, both from the International Action Center. Speakers representing other anti-war coalitions included Bill Fletcher, Jr., co-chair of United for Peace and Justice; Damu Smith from Black Voices for Peace; Medea Benjamin from Global Exchange, and Miles Solay from Not In Our Name. In August 2004 Medea Benjamin endorsed an anti “Bush Team” Protest at the Republican National Convention in New York, organized by Not In Our Name, an organization closely associated with the Revolutionary Communist Party. Medea Benjamin was one of 100 "prominent Americans" who signed an October 26 2004 statementcirculated by 911Truth.org calling on the U.S. Government to investigate 9/11 as a possible "inside job". In December 2004, US Senators Barbara Boxer of California, Raul Grijalva of Arizona and Congressmen Dennis Kucinich of Ohio and Henry Waxman of California provided diplomatic courtesy letters to a contingent of anti-war groups and individuals desiring to Fallujah, Iraq. Among those travelling in the contingent were: Rosa Suarez del Solar and her husband Fernando Suarez del Solar; Jeffrey Ritterman, Physicians for Social Responsibility; Jodie Evans, co-founder of CodePink: Women for Peace; Medea Benjamin, co-founder of Global Exchange and CodePink; Hany Khalil, national organizer, United for Peace and Justice. The organizations sponsoring the tour were CodePink, Project Guerrero Azteca for peace, Global Exchange, the Middle East Children's Alliance, Physicians for Social Responsibility, Peace Action, United for Peace and Justice, and Voices in the Wilderness. 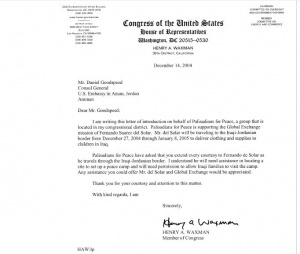 Fernando Suarez del Solar stated that had it not been for the help of the two congressmen, the tour would have not seen the light due to obstacles laid by the Pentagon. The contingent traveled from December 27, 2004 through January 8, 2005. The contingent delivered $100,000 in cash and and $500,000 in humanitarian aid. At the time the diplomatic courtesy letters were issued, Medea Benjamin had stated that the aid was intended for families of the “other side” in Fallujah. 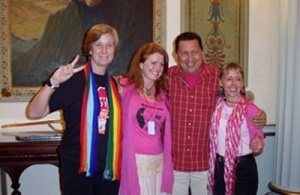 On 28 January 2006, Jodie Evans, Medea Benjamin and Cindy Sheehan visited with president of Venezuela, Hugo Chavez. In 2005 Medea Benjamin, Global Exchange was on the Steering Committee of United for Peace and Justice. March 5-9, 2007 Hundreds of activists from around the world came together March 5 through 9 to attend the International Conference for the Abolition of Foreign Military Bases at the Catholic University in Quito, Ecuador. Many U.S. activists were present at the conference including Medea Benjamin from Global Exchange and Code Pink; Joseph Gerson of the American Friends Service Committee; Ikaika Hussey, a Hawaiian anti-base activist; Genaro Rendon, Co-Director of the Southwest Workers Union and the Committee for Environmental Justice Action in San Antonio, Texas, and John Lindsay-Poland of the Fellowship of Reconciliation. DC Protest Against "The Surge"
Medea Benjamin, Sean Penn, Maxine Waters, Jesse Jackson, Susan Sarandon, Tim Robbins and others lead Jan 29, 2007 march. In 2008 Medea Benjamin of Global Exchange/CODEPINK, San Francisco, CA signed an online petition “A Open Letter to Barack Obama on Iran”. Medea Benjamin serves on the Advisory Board of Progressive Democrats of America. In 2009 Medea Benjamin, CODEPINK, San Francisco. CA served on the board of directors of Healthcare-Now! . The National Peace Conference, took place at the Crowne Plaza Hotel in downtown Albany New York, July 2010. Many workshops are scheduled and many leaders of the peace and progressive movements will be there: Cindy Sheehan, Kathy Kelly, Medea Benjamin, Ann Wright, Dahlia Wasfi, Leila Zand, Michael McPhearson, Kevin Martin, David Swanson, Glen Ford, and many others. Keynote speakers were Noam Chomsky and Donna DeWitt (President of the South Carolina AFL-CIO). Is the U.S. military really leaving Iraq or just rebranding? What is the toll of seven years of occupation on Iraqis, U.S. soldiers and our economies? What is the status of Iraqi refugees around the world? Is it still possible to hold accountable those who dragged us into the war or committed crimes such as torture? What role did Congress and the media play in facilitating the invasion/occupation? We'll also look at the role of the peace movement -- its strengths and weaknesses -- and draw key lessons to make our work for peace, including in Afghanistan, more effective. The event was sponsored by: CODEPINK, Peace Action, Institute for Policy Studies, Fellowship of Reconciliation, Global Exchange, Just Foreign Policy, Veterans for Peace, Iraq Veterans Against the War, Military Families Speak Out, Progressive Democrats of America (PDA), U.S. Labor Against the War, ANSWER, World Can’t Wait, Voices for Creative Nonviolence, War is a Crime, Rivera Project, Washington Peace Center. Thursday March 15, 2012, PDA National Director Tim Carpenter, PDA National Vice Chair emeritus Stephen Shaff, PDA National Deputy Field Director Andrea Miller and Mike Hersh welcomed speakers Rep. Donna Edwards (Md-6), Professor Eric Kingson from Social Security Works, and Alex Lawson from We Act 1480 AM Radio to Busboys and Poets in Hyattsville, Maryland. Current and former PDA National Board Members Medea Benjamin, Joe Libertelli and Steve Cobble, Healthcare NOT Warfare co-chair Donna Smith, and Maryland Senator Paul Pinsky also helped welcome progressives to Prince George's County's newest meeting place. The turnout included several important progressive leaders from Maryland's 4th, 6th, and 8th districts. Special thanks to the Very Important Progressive Host Committee including--Stephen Shaff; PDA board member Bill Fletcher, Jr., Raucus Activist Writer; Alex Lawson, Social Security Works and WE ACT Radio; Heather Booth, Activist; Steve Cobble, PDA Political Advisor, and Institute for Policy Studies; Medea Benjamin; Tom Hucker, MD Delegate, D-20; Greg Moore, NAACP/Political Consultant; Beth Becker, Progressive PST; Naomi Bloch, Activist who donated a small library of books; David Hart, Physicians for Social Responsibility; Beth Schulman, IPS; Greg Smith, Activist; Joe Libertelli; Mark Dudzic; Jimmy Tarlau, Communication Workers of America; Kerren-Pope Onwukwe, Attorney/Activist; and Andrea Miller. According to an April 2012 press release from Lauren Love, Rainbow/PUSH Coalition, and Eric Ruder, Coalition Against NATO/G8, the Rev. Jesse Jackson and other community and labor leaders will gather on Thursday, April 19, at 11:15 am on the 2nd floor of City Hall to announce their plans to march in opposition to NATO. The march will take place on Sunday, May 20, which is the first day of the NATO summit, and is being organized by the Coalition Against NATO/G8 War and Poverty Agenda (CANG8). Rev. Jackson will also announce his plans to speak at CANG8’s People’s Summit at Occupy Chicago’s headquarters on May 12–13, the weekend before the NATO summit. Standing with Rev. Jackson to announce their support for the march and People’s Summit will be Occupy Chicago; the Chicago Teachers Union; the National Nurses United; and members of the Service Employees International Union. CANG8 organizers are pleased to be joined in their efforts by many other community and labor leaders in addition to Rev. Jackson. “ “This march will take place at a crucial moment in NATO’s war on Afghanistan as a majority of Americans have now turned against further U.S. involvement there,” said Joe Iosbaker, a CANG8 organizer. “Occupy Chicago is proud to support the May 20 march being organized by the Coalition Against NATO/G8,” said Rachael Perrotta, a member of Occupy Chicago’s press team. Other noted speakers at the May 20 march and the People’s Summit include Malalai Joya, former Afghan member of Parliament and internationally renowned opponent of NATO’s occupation of Afghanistan; Reiner Braun, International Coordinating Committee of the European No to NATO network; Kathy Kelly, Voices for Creative Nonviolence; Malik Mujahid, Muslim Peace Coalition; Medea Benjamin, Code Pink; and Col. Ann Wright (ret. ), antiwar activist. In addition to specifying Jesse Jackson, , speakers will now include, along with those announced earlier: Leah Bolger, head of Veterans for Peace, who was recently tried for “disrupting” the so-called SuperCommittee in Congress; Carlos Montes, who was targeted by an FBI raid in Los Angeles; Kari Fulton, of the Environmental Justice movement; and Larry Holmes, of International Action Center. August 27, 2012, well over 1,000 people rallied and marched in the streets of Tampa to demand good jobs, affordable education, healthcare, equality, and peace. Although the Republicans cancelled the first day of their convention due to Hurricane Isaac, organizers with the Coalition to March on the RNC went through with their promise to march on the first day of the convention to show their opposition to the agenda of the 1% and their support for a People’s Agenda. Notable speakers included Carlos Montes, a leading immigrants’ rights leader; Joe Iosbaker; a spokesperson for the anti-war movement; Skye Schmelzer, representative of the National Students for a Democratic Society; Medea Benjamin, a co-founder of Code Pink and major peace activist; Ciara Taylor, a representative of Dream Defenders and a Black community organizer; Nelini Stamp, one of the original organizers of Occupy Wall Street; and Oscar Otzoy, a Florida farm worker organizer with the Coalition of Immokalee Workers. Organizations present included Students for a Democratic Society, Veterans for Peace, Southern California Immigrant Coalition, Southern Christian Leadership Conference, five Florida Occupy chapters, six Fight Back Florida chapters, Dream Defenders, United National Anti-war Coalition, Committee to Stop FBI Repression, International Action Center, Code Pink, four Florida AFL-CIO labor councils, and Region 3 of AFSCME Council 79. It was remarkable how many non-Cubans knew the Cuban national anthem well enough to sing along July 2015 as the flag was raised over the newly re-established embassy on 16th Street NW. Then they joined in the delirious shouts of "Viva Cuba!" "It's an amazing moment," said Phyllis Bennis, a fellow with the progressive think-tank, Institute for Policy Studies. "In the decades-long effort to normalise relations with Cuba, to stop the US attacks and hostility toward Cuba, we have not had so many victories. Suddenly we have a victory. The flag going up - that's huge." Not that there wasn't plenty of unfiltered emotion. Standing near Bennis was Valerie Landau, daughter of the late documentary film-maker and activist Saul Landau. The elder Landau spent the better part of his life working towards this moment, before cancer cut his work short in the middle of another documentary on Cuba, in 2013. Travelling with Castro through Cuba in the late 1960s, he memorably filmed the revolutionary leader shedding his uniform and playing baseball, shirtless, with peasants. "We're continuing his work in our own way," said Valerie Landau, who leads tours to Cuba and also works with the Cuban Health Ministry on education programmes. "I think this is a real crossroads, and there's going to be a lot of change in Cuba. Some of it at their own speed and choice, and some of it as a result of an avalanche of interest on the part of Americans who're hungry to know and see Cuba." The limestone and marble mansion opened as the Cuban Embassy in 1919 and quickly established itself as a delightful society-party venue. Diplomatic relations were broken in 1961, two years after Castro took power. The mansion was shuttered. It reopened in 1977 as the Cuban Interests Section, parallel with a US Interests Section in Havana. The move to have fully fledged embassies again came after President Barack Obama and President Raul Castro resolved in December to normalise relations. Code Pink provided entertainment|with chants and signs that said "Salsa se­! Embargo no!" "I didn't know if I'd live to see this day," said Code Pink organiser Medea Benjamin, who lived in Cuba from 1979 to 1983. She said she was deported for being so outspoken - hence her "love-hate relationship" with Cuba. Lately it has been more love. She leads large tours of activists to the island and is planning an upcoming teach-in in the city of Guantanamo against continued US control of the Guantanamo Bay Naval Base. Inside the embassy, actor Danny Glover drifted from room to room. A regular visitor, his ties to Cuba run so deep that when the remaining Cuban Five prisoners were released by the US in December, one of the first phone calls made by their informal leader, Gerardo Hernandez, as a free man was to Glover. Glover found his way over to celebrated Cuban folk singer Silvio Rodriguez, who was one of the bold-faced names from the island included in the Cuban delegation. The reception was liberally sprinkled with Democratic senators and members of Congress, some of whom have been toiling at reaching out to Cuba for as long and as hard as the activists and the policy experts. "I've spent 25 years in Congress trying to change this policy," said Democrat Jose Serrano, who hosted Castro in the Bronx in 1995, and was criticised for it by some. "We gave him a party at a place called Jimmy's Bronx Cafe. People who went to that event are texting me now saying 'Don't you feel vindicated?'" "There was a war for 56 years, and|the war is over," said Philip Brenner, a professor in the School of International Service at American University. Institute for Policy Studies' Phyllis Bennis joined a line up of special guests for an inter-generational teach-In on the triple evils of militarism, economic exploitation, racism, January 18 2016, 5th and K Busboys & Poets. Washington DC. At this tribute to Dr. Martin Luther King, Jr. the discussion will tease out the role of popular culture: 60s vs. now, the international implications of Dr. King’s Vision, and the links between economic exploitation and racism. Participants included: Dr. Clarence Lusane, Joni Eisenberg, Rev. Graylan Hagler, Medea Benjamin, Phyllis Bennis, Dr. Vanessa Wills, Jeremiah Lowery, Dr. Maurice Jackson, Frank Smith, Dave Zirin, Jay Mills, Ayanna Gregory, In Process, and Live Audience Participation from Busboys! Co-Moderators: Youth Activist Princess Black and Dr. Greg Carr, Howard University. Members of the US Cuba and Women's Collaboration, as of December 27, 2017 included Medea Benjamin. With Meri Joyce, JT Takagi, Chung Hyun Kyung, Coleen Baik, Jean Chung, Kozue Akibayashi, Gay Dillingham, Erika Guevara Rosas, Lisa Natividad, Grace Grace Grace, Hye-Jung Park, Deann Borshay Liem, Medea Benjamin, Ann Wright, Abby Disney, Gwyn Kirk, Jane Jin Kaisen, M. Brinton Lykes, Jodie Evans and Una Kim. Lisa Natividad One of my fondest memories of being in the DPRK!!!!! Ann Wright What great memories from our May 2015 trip to North Korea!! I hope we can go again--although the Trump administration is denying our requests for the Special Validation Passports they now require! 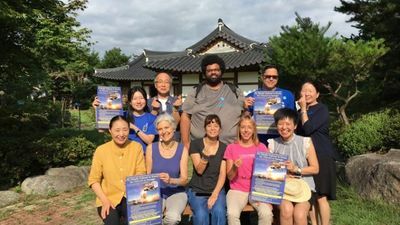 The U.S. Solidarity Peace Delegation in South Korea July 2017, to build solidarity with the peace/anti-war movement there -- visited the village of Soseong-ri in Seongju County from July 24 to 27 to support the villagers in their fight to stop the deployment of the U.S. THAAD anti-missile system there. The delegation -- Jill Stein of the Green Party USA, Medea Benjamin of CODEPINK, Reece Chenault of US Labor against War, and Will Griffin of Veterans for Peace -- heard from the villagers of Soseong-ri about their year-long anti-THAAD struggle. “Our children no longer want to come here. If the THAAD comes, the water will go bad, the air will be bad,” said an elderly farmer. “Will the THAAD protect us? No, it won’t. If the THAAD comes, we think it will be war,” said another grandmother, who worried that the THAAD will only make Soseong-ri and Seongju a target in the crossfire between the United States and its opponents in the region. The delegation -- organized by the Task Force to Stop THAAD in Korea and Militarism in the Asia Pacific's (STIK) -- asked the residents to send a message to CEO Marillyn Hewson of Lockheed Martin, the leading U.S. weapons manufacturer. “You are also a mother. Stop making weapons of destruction and contribute to making peace,” they said. The delegation also participated in an anti-THAAD rally in Seongju, where the local residents displayed a model of the U.S. THAAD battery then proceeded to smash it as a demonstration of their disapproval of the war weapon. Members of the Metro DC Democratic Socialists of America, public Facebook group, as of October 14, 2017 included Medea Benjamin. Howard University Education Department will present Maestra this Thursday at 2pm - free & open to the public! Come on over friends in the DMV! — with James Early, Kymone Tecumseh Freeman, Medea Benjamin, John Lists, Deborah Menkart, Paul Ortiz, Makani Themba, Karen Hampton, Karen Mafundikwa, Doris Derby, Luisa Crespo, Talaya Grimes, Annette Martin, Rhone Fraser, Mimi Machado-Luces, Saad Hayes Sodaye, Matthew White, Lisa Brock, Netfa Freeman, Sira Orozco, Luisa Campos, Eve Goldberg, Luci Murphy, Alison Kibbe, Curtis Muhammad, Mwiza C K Munthali, Mia Henry, Michelle Darden Lee, Alli Jarrar, Banbose Shango, Shah Boo and U.S. Women and Cuba Collaboration at Howard University. CAIR blames President Trump for New Zealand mosque massacre, calls for more hate crime and "hate incident" laws. A press conference posted on Facebook shows "CAIR, Interfaith Allies" blaming President Trump for the massacre in Christchurch New Zealand on March 15, 2019. This page was last modified on 18 March 2019, at 06:50.